Consumers needing to roof or re-roof are lucky enough to be able to choose among a wide array of solutions available on the market: steel, concrete tile, cedar and, of course, asphalt shingles, which are the most commonly used roofing material in Quebec, mainly because they are the most inexpensive solution over the short term. But what about the long-term cost? While slightly more expensive to purchase, aluminum roofing has undeniable benefits. If you’re planning to own your home for many years, an aluminum roof means you’ll never have to replace it again. Your investment becomes cost-effective when it would be time for the second re-roofing. And if you decide to sell, your warranty is transferrable and your roof will add value to your property. In addition to having a lower cost over a longer life cycle, aluminum roofing is the best choice in terms of several other criteria. 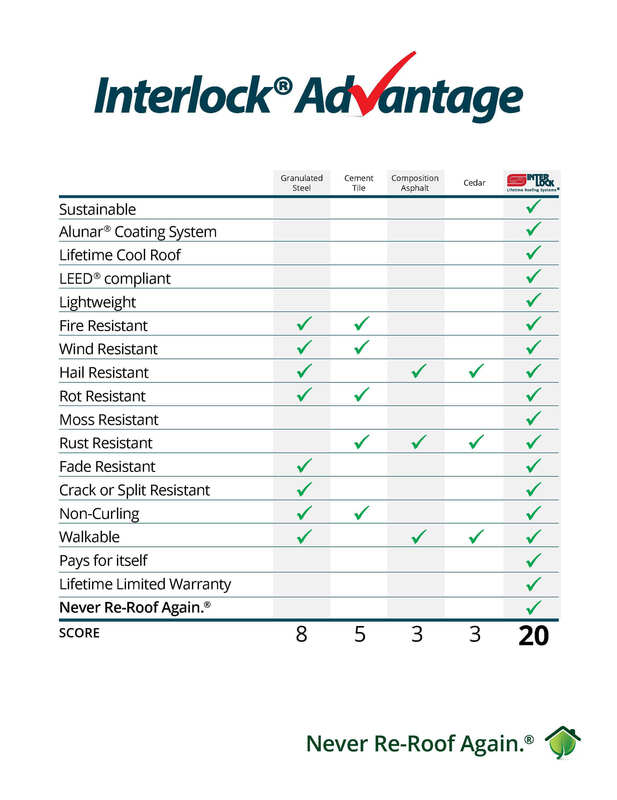 Because an Interlock® aluminum roof doesn’t absorb any water, it stays light, which is a sizable advantage for maintaining a building’s structural integrity.